Hyponatremia is a common electrolyte abnormality. It can be acute or chronic. It can occur in isolation or as part of other disease processes. Diagnosing its cause can be challenging in the Emergency Department and there may be some confusion over how to initially manage these patients. Let’s clear up that confusion, with a simple 3 step process to diagnosis and a simple binary approach to treatment. But first, a short summary of the condition. What are the potential causes and how would you treat this patient in the emergency department? We will come back to this case a little later. The condition can be acute or chronic. Those patient with chronic hyponatremia can surprisingly present with few symptoms, even with very low levels of serum sodium, sometimes less than 115 mmol/L. However a rapid drop, i.e., of the same amount over 24-48 hours can result in severe cerebral oedema and brainstem herniation. Classically patients are diagnosed according to their volume status. This may not be as easy to do as it seems on paper. 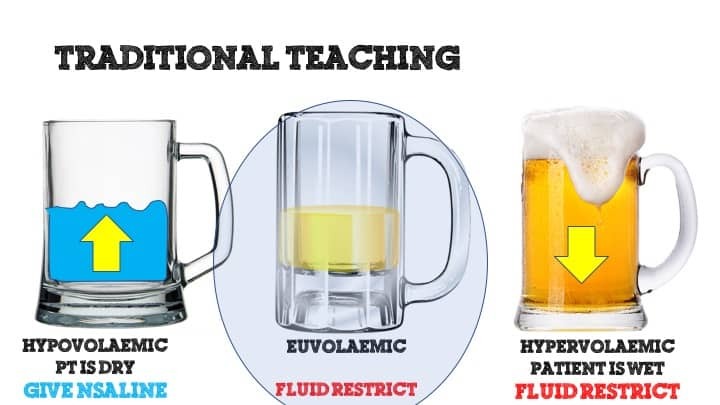 It is sometimes difficult to tell euvolaemia from mild to moderate dehydration. This is is where the simplified method shown below will assist. The volume status model is still useful in looking at potential causes. Interestingly, in the literature various causes are placed in a different subcategory. For example hypothyroidism has been placed in both the hypovolaemic or the euvolaemic categories. This occurs when sodium and free waster is lost and replaced by hypotonic fluid. This occurs when there is normal body sodium but an excess of free water. As an overriding statement FLUID RESTRICT EVERYONE! If you are certain that they are dry, dry, dry, then give them some 0.9%Normal Saline, otherwise Fluid restrict all. This is the path to causing no harm. If they have a depressed conscious state, but not coma, or having other severe symptoms give 100ml of 3% saline over 60 minutes. This raises the Na by 2 mmol/L. You can repeat. If they are in a coma or having a seizure, give 100ml 3% over 10 minutes. You can repeat. BEWARE! Do not raise the serum Na by more than 8mmol over a 24 hour period as you will cause significant neurological sequelae. Diagnosing the cause of your patients hyponatremia may be straightforward. They may be overloaded, known to have cirrhosis, or they tell you they have had vomiting and diarrhoea for three days with no fluid intake. These cases are simple. If they are not as clear cut, diagnosing may be difficult and may not be possible at presentation in the emergency department. Look at the serum osmolality. If > 290mmol/kg it is due to other proteins and may be due to hypertriglyceredaemia, or multiple myeloma etc. 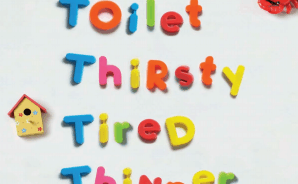 What is the Urine Osmolality? This means that the urine is concentrated. Is this because there is more salt than water lost or less water than salt lost. What is the urine Na? This may be a little simplisitic, but as a preliminary set of differentials serves the purpose. You would fluid restrict this patient, until you knew more. In this case, the patient is on a loop diuretic, which doesn’t tend to cause hyponatremia. He is on an ACE inhibitor, which can cause, it, but has been on this for some time. His bloods were all run and the working diagnosis was SIADH. Remember SIADH is a diagnosis of exclusion. Synacthen test was negative, so a diagnosis of salt wasting syndrome was made. Let me know if you’ve had some cases of this or can modify this even more so others can use.